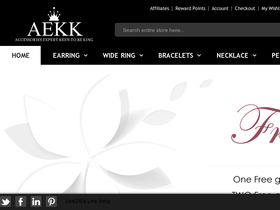 AEKK, online at aekk.com, offers a beautiful collection of jewelry that doesn't break the bank. AEKK provides brilliant, elegant, and charming collections, featuring sterling silver, 18K gold plating, gemstones, crystals, and beads. AEKK offers sparkling earrings, rings, bracelets, necklaces, charms, pendants, and wedding rings - all at discounted prices. AEKK is a great destination for finding unique gifts for yourself and loved ones. But before you shop, check out RetailSteal.com for the latest AEKK discounts, AEKK promo codes, and AEKK coupon codes. AEKK offers shipping promos that change often. Stop by RetailSteal.com for the latest AEKK shipping special offers. AEKK offers standard and expedited shipping options. AEKK ships to the United States and worldwide. Use this coupon code online at Aekk.com and enjoy a 10% discount on your purchase. Save up to 80% on the latest jewelry special offers from AEKK. Click link to shop. Shop at AEKK and enjoy free shipping on your purchase $15.90+. Shop at AEKK and save up to 33% on stylish necklaces. Click to shop. Shop at AEKK and enjoy free gifts with purchases $49+. Click here to shop. Shop at AEKK and save up to 33% on cute bracelets. Click to shop. Save up to 33% or more on earrings from AEKK. Click link to shop. Save $5 on your AEKK purchase when you enter this promotional code at checkout!